Florida Museum researchers’ discovery of a giant fossilized snake reveals that the tropics were ruled by beasts larger than anyone imagined. 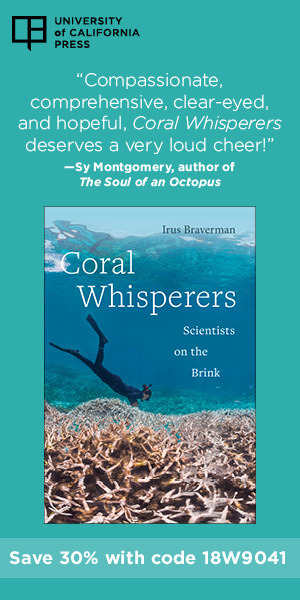 The following story is contributed by the Florida Museum of Natural History, one of Natural History magazine’s Museum Partners. Members of any of our partner organizations receive Natural History as a benefit of their museum membership. At the Florida Museum of Natural History, visitors may enjoy hundreds of exotic butterflies in a rainforest setting, witness a South Florida Calusa Indian welcoming ceremony, experience a life-sized limestone cave, and see a mammoth and mastodon from the last Ice Age. Permanent exhibits include Northwest Florida: Waterways & Wildlife; South Florida People & Environments; Florida Fossils: Evolution of Life & Land; and the McGuire Center for Lepidoptera and Biodiversity, which features the screened, outdoor Butterfly Rainforest exhibit with hundreds of live butterflies. Located at the University of Florida, in Gainesville, this is Florida’s state museum of natural history, dedicated to understanding, preserving and interpreting biological diversity and cultural heritage. 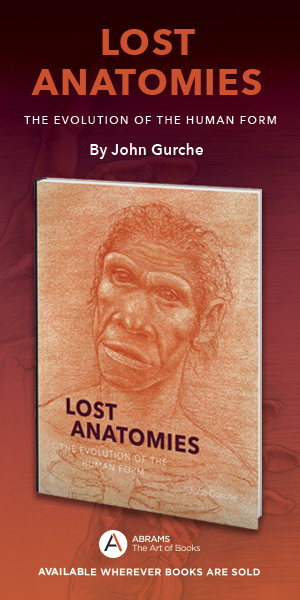 For further information, visit the Museum’s Web site, www.flmnh.ufl.edu. 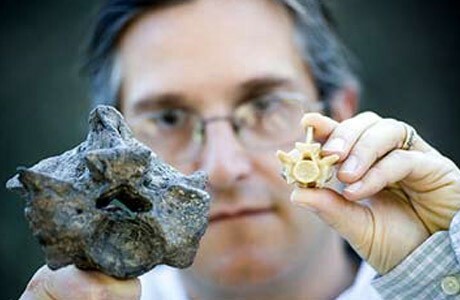 Florida Museum of Natural History vertebrate paleontologist Jonathan Bloch shows the size difference between vertebrae belonging to the giant snake Titanoboa cerrejonensis, left, and an anaconda. Based on the diameter of the fossilized Titanoboa vertebrae, researchers estimate that Titanoboa, which lived 60 million years ago, probably grew 45 feet long. The anaconda measured a relatively short 17 feet long. The largest snake the world has ever known—as long as a school bus and as heavy as a small car—ruled tropical ecosystems only 6 million years after the demise of the fearsome Tyrannosaurus rex, according to a new discovery published in the journal Nature. Partial skeletons of a new giant, boa-constrictor-like snake named Titanoboa found in Colombia by an international team of scientists and now at the Florida Museum of Natural History are estimated to be 42 to 45 feet long, the length of the T-rex “Sue” displayed at Chicago’s Field Museum, said Florida Museum of Natural History vertebrate paleontologist assistant curator Jonathan Bloch, who co-led the expedition with Carlos Jaramillo, a paleobotanist from the Smithsonian Tropical Research Institute in Panama. Besides tipping the scales at an estimated 1.25 tons, the snake lived during the Paleocene Epoch, a 10-million-year period immediately following the extinction of the dinosaurs 65 million years ago, Bloch said. Assistant curator of vertebrate paleontology Jonathan Bloch (foreground) holds vertebra from the Titanoboa while graduate assistants Alex Hastings (farther back) and Jason Bourque (in distance) illustrate the estimated mid- and end-points of the giant snake. The world’s largest vertebrate on earth for 10 million years, Titanoboa grew up to 45 feet long and weighted 1.25 tons—about the weight of a small car. Its body was about as wide as the aisle where the researchers are standing. 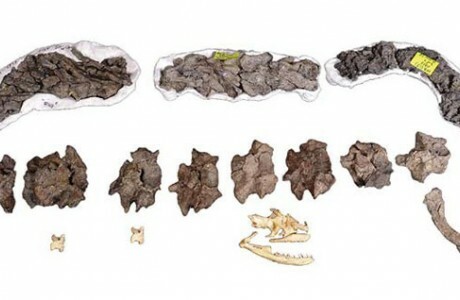 The scientists also found many skeletons of giant turtles and extinct primitive crocodile relatives that likely were eaten by the snake, he said. Size does matter because the snake’s gigantic dimensions are a sign that temperatures along the equator were once much hotter. That is because snakes and other cold-blooded animals are limited in body size by the ambient temperature of where they live, Bloch said. “If you look at cold-blooded animals and their distribution on the planet today, the large ones are in the tropics, where it’s hottest, and they become smaller the farther away they are from the equator,” he said. “Based on the snake’s size, the team was able to calculate the mean annual temperature at equatorial South America 60 million years ago was about 91 degrees Fahrenheit, about 10 degrees warmer than today.” Bloch said. The presence of outsized snakes and freshwater turtles shows that even 60 million years ago the foundations of the modern Amazonian tropical ecosystem were in place, he said. Fossil hunting is usually difficult in the forest-covered tropics because of the lack of exposed rock. But excavations in the Cerrejon Coal Mine in Northern Colombia exposed the rock and offered an unparalleled opportunity for discovery, Bloch said. After the team brought the fossils to the Florida Museum of Natural History, it was UF graduate students Alex Hastings and Jason Bourque who first recognized they belonged to a giant snake, Bloch said. 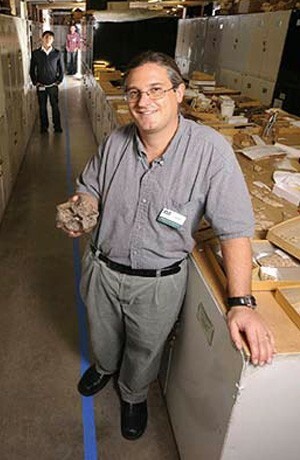 Head, an expert on fossil snakes, worked with David Polly, a paleontologist at the University of Indiana, to estimate the snake’s length and mass by determining the relationship between body size and vertebral—backbone—size in living snakes and using that relationship to figure out body size of the fossil snake based on its vertebrae. Researchers have collected vertebrae and ribs from 28 different Titanoboa snakes in the coal mines of Colombia. A couple vertebrae and a jaw from a modern-day anaconda, underneath, show just how large Titanoboa grew.